If you didn't know, I am a Bachelor fanatic and have been watching the show for years. 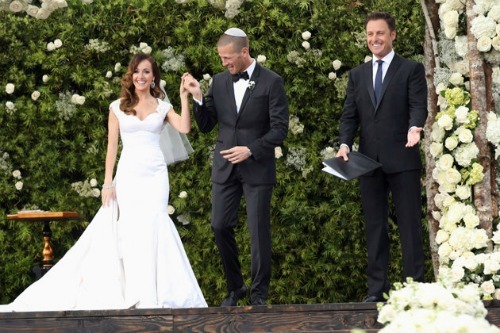 Did anyone tune in to The Bachelorette: Ashley and JP's Wedding on Sunday night? The wedding was up against the Patriots game, so there was no way I was going to see it as it originally aired. I finally watched it last night. What did you think of Ashley's look? I am a fan of the sleeves and open back. I was nervous for her walking down the steps and aisle... that was a lot of dress! Bling bling. 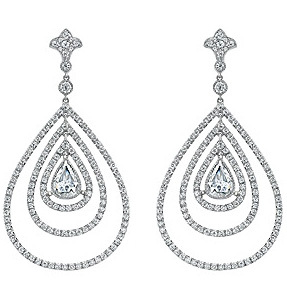 What's not to like about her Neil Lane earrings. It's been 9 years.... I just remember a lot of pink. Her shoes remind me of the style I wore to prom that year, except mine were definitely not $50,000 or encrusted in diamonds. Gorgeous. I loved her cascading bouquet. 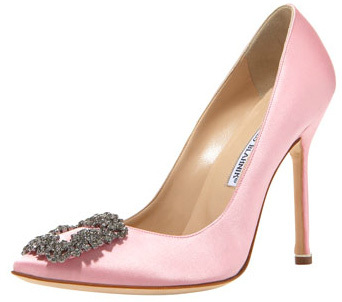 I will never forget when Molly's custom Manolo Blahnik's were presented on a tray. It's one of my favorite Bachelor moments. Mr. Blahnik, I'd love the same pair in navy. I wish I had been a bridesmaid, because they all got a pair too. Which Bachelor/Bachelorette wedding fit your style? What colors did you like best? Any memorable moments? As for my own wedding update... I picked out my dress on Saturday. I have dreamed of wearing a Monique Lhuillier design on my big day for years... and lucky for me the style I had in mind worked out perfectly. I was in and out of The Plumed Serpent Bridal in Westport in under two hours. The owner Alison and the Monique Lhuillier consultant were both helpful. Great experience! PS - Please vote for me, Lindsay, in the OnlineShoes.com Monthly Style Contest! I just watched Ashley's wedding on Monday night, I thought her dress was the best bachelorette dress yet. Very classy with the sleeves and yet very sheik with the open back. Girl has some taste. Did you see Ali and Roberto all sitting next to each other?? hmmmm reunion? I totally agree with you on the sleeves. I really liked her dress but I don't think Ashley pull it off very well as tiny as she is! Maybe because I think she's super corny, love the bachelor though and can't wait til jan 7th! I loved their entire wedding! The dress was stunning and Ashley and JP were so sweet! Congratulations on finding your dress! Agree that Ashley's dress, especially the sleeves, were prefect for her. weddings are such beautiful events!! !